Though Victor Moses has played all his club football in England he is yet to win any honours. He is through to the finals now with Chelsea. 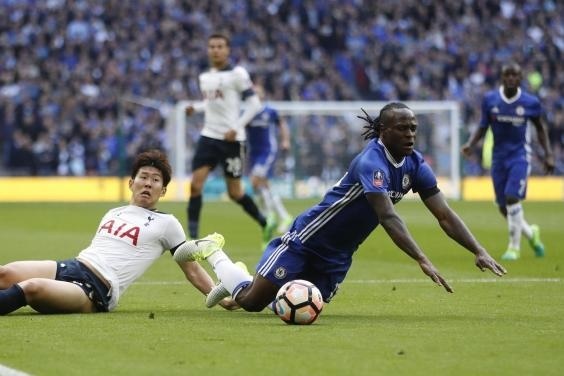 The year 2017 is continuing to be a remarkable one for Nigerian international, Victor Moses who is finally closing in on his first set of silverware. On Saturday, the 26-year old took a big step forward as he and his Chelsea teammates secured a 4-2 win over Tottenham to qualify for the final. It was Willian that opened the scoring with a well-placed free-kick after five minutes and the Brazilian added his second from the spot two minutes before the break. Harry Kane had headed in from Christian Eriksen's cross to equalise for Spurs, who pulled level again from Dele Alli. Substitute Eden Hazard put Chelsea in front, before Matic fired in the fourth to keep them on course for the double. Chelsea will face the winners of Sunday's semi-final between Manchester City and Arsenal in the final on Saturday, May 27. Saturday’s win means the Blues are gunning for an astonishing 8th FA Cup title since winning the competition first in 1970.